Azerbaijan’s ‘black brilliant’ Rafael Aghayev won a gold medal in karate (kumite) competitions at the 4th Islamic Solidarity Games in Baku. He secured the gold medal thanks to a victory over Pakistani Ghulam Abbas in the 75kg division final. 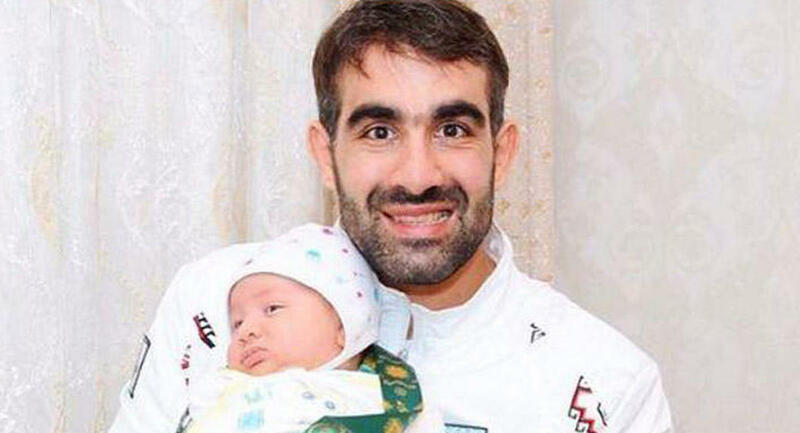 The karate fighter posed for photographers together with his two-month son after winning the gold medal. Rafael Aghayev, five times world and 10-times European champion, who fights in 75kg weight class started his way at 1/8 final stage. He defeated his first rival, Turkish sportsman Erman Eltemur with score 3:0. He took victory (5:2) over Saudi Arabian Sultan Al-Zahrani at quarter final. The Baku 2017 Islamic Solidarity Games, the opening ceremony of which took place May 12, started May 8 and will last until May 22 in Azerbaijan’s capital.